RC Warbirds: These RC Warplanes are exciting flyers. RC Warbirds. How to select from the many war birds available. From small Park Flyers to Quarter Scale RC. 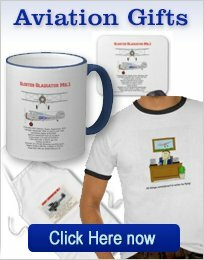 RC kits, the ARF RC airplane and RC airplane plans are discussed. Photo shows the Top Flite P-51 Mustang 60 kit. Click the photo or here to visit Amazon. RC warbirds must be the most popular type of RC airplane. Anyone wanting to enter this hobby would love to start of with a war bird-but generally speaking, please resist the temptation! Models of RC warplanes can be a challenge to fly, for the new, would-be RC pilot. 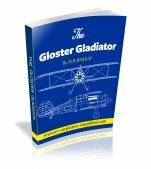 It may be much better to consider a beginner RC airplane, as described on this page. These are much easier to fly and with the help of a good instructor can be the easiest and least expensive way to get your wings! Generally speaking warbirds require more than a 4-channel radio. They can be equipped with retractable landing gear and flaps and this means that 6-channels are the minimum and usually a bunch of servos are required. 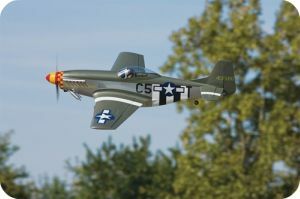 Warbirds RC are available as almost any type of RC airplane, from electric powered park flyers to quarter scale masterpieces and almost any size in between. 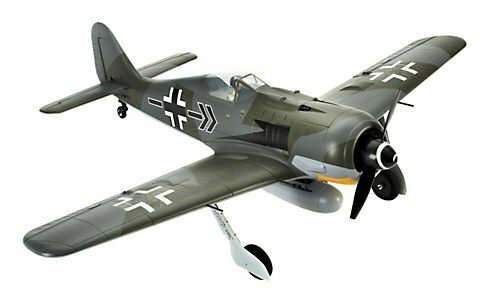 If completely ready to fly is the style you prefer, then you need look no further than the Parkzone range of RC warbirds. They have been around now for a quite a while and do come completely built and ready to go. Some models include the radio transmitter, batteries and battery charger. They have sold in the thousands and have a reputation of being good flyers and they certainly have excellent looks and finish. The construction material is molded foam, which makes for a light but tough airplane. Ready To Fly ( RTF) This is a complete model, usually with radio transmitter and receiver. Servos are fitted as well and the battery and a charger are included. Plug aNd Play ( PNP) This generally means that a suitable receiver must be plugged in. You must provide a transmitter and a battery charger. Bind aNd Fly ( BNF) A 2.4 Ghz transmitter must be provided, but otherwise the system is complete. Please check before you buy, so as you understand completely what exactly you are purchasing and avoid any disappointment! The photo shows the Top Flite P-51 Mustang. This model is available as a kit, as well as an ARF. 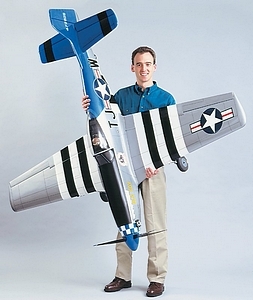 This is a large scale RC plane with a wing span of 84.5" and a finished weight of 17.5-19lbs. It requires a glow engine of 2.1-2.8 cu.in or a gas engine of 2.5-4.2 cu.in. A radio of 6-7 channels is needed along with 10 servos. For those of us who still love to build, this Gold Edition kit is a real treat! The engineering and parts production and fit is first class. Being a kit the finish is up to you-so it is possible to make a beautiful, one of a kind RC warbird! 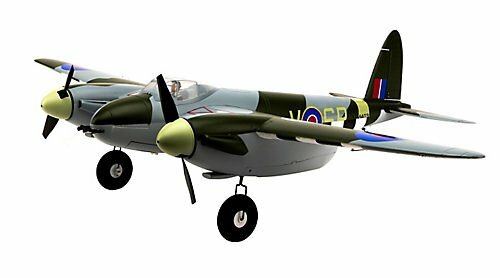 For more details on the giant scale P-51 by Top Flite, visit this page on this site. The larger, gas powered war birds can be built from plans. The range of types available is generally larger and some very successful models have been built, using plans. Many of the contestants, at the large scale contests, have built their models this way. 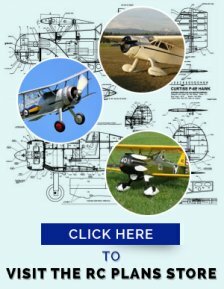 Take a look at this page "How to Build Radio Controlled Airplanes from Plans" for more details on the techniques used. 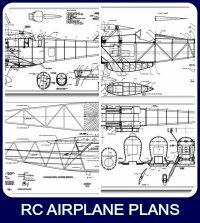 For the best selection of scale aircraft plans we recommend Jerry Bates Plans. All of Jerry's plans are of excellent quality and of proven performance. Click here or on the logo to the left to visit his website. Nick Ziroli has designed and flown, in competition, a LOT of RC warbirds! Both single and multi engine types are available. The Fairey Fantome and The Curtiss P-6E Hawk are RC warbirds available here. Cad drawn plans and full details can be seen on this page.